Situated on the Colorado Plateau in northwestern Arizona, this Monument touches the Grand Canyon to the south, and Nevada to the west, encompassing part of Lake Mead National Recreation Area. The Monument is under the joint management of the Bureau of Land Management and the National Park Service. Parashant is remote and a scientific treasure, containing many of the same values that have long been protected in the Grand Canyon. Deep canyons, mountains and lonely buttes testify to the power of geological forces and provide colorful vistas. Here, Paleozoic and Mesozoic sedimentary rock layers are relatively undeformed and unobscured by vegetation, offering a clear view to understanding the geologic history of the Colorado Plateau. This is a remote area, and offers the hearty adventurer miles of unpaved and often extremely rough roads. Visitors will enjoy seeing the unique combination of desert flora and deep canyons with exposed rock formations. Vegetation ranges from Mohave Desert sagebrush to ponderosa pine forest. I haven't been here yet. Since the Monument was established in 2000, it hasn't gotten a lot of publicity, and I'm still working on finding out if it offers a stamp for my Passport. 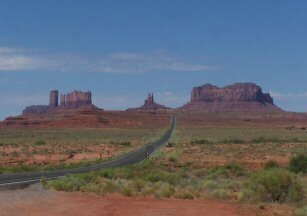 Although Parashant is in Arizona, it makes sense to approach the Monument from St. George, Utah. That pesky little ditch called the Grand Canyon kind of gets in the way, you know? In St. George is the Interagency Information Center, at 345 E. Riverside Dr., where you can pick up maps and information on Parashant. From St. George, Utah, take BLM gravel road 1069 south across the Arizona border. The Monument lies about 30 miles south of that; there are no paved roads, so a map is critical to your eventual safe return. Lake Mead National Recreation Area is directly to the west. Grand Canyon National Park is directly south and east. Vermilion Cliffs National Monument is to the northeast, and directly below Grand Staircase-Escalante National Monument. A little closer, but still to the northeast lies Pipe Spring National Monument in Arizona, and Coral Pink Sand Dunes State Park, in Utah. Zion National Park, to the north, is a Park you just can't miss.